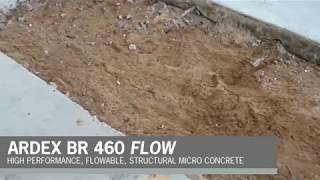 ARDEX BR 460 FLOW High Performance, Flowable Structural Micro Concrete is a pourable repair mortar designed for reinstating horizontal concrete surfaces damaged through concrete spalling and other chemical or mechanical causes. ARDEX BR 460 FLOW exhibits superior flow characteristics and is capable of being applied in thicknesses of 20mm to 200mm in one pour. It is designed to be used in conjunction with ARDEX BRX 60 LO Low Output Anodes for ultimate corrosion control and cathodic prevention. For more than 60 years, ARDEX has been the quality leader for an entire industry, offering excellent building chemicals with supreme processing reliability – the brand of choice for installers and wholesalers.